On October 9, The Associated Press reported that Kemp has “cancelled over 1.4 million voter registrations since 2012” through purges of voter rolls, including almost 670,000 registrations in 2017 alone. Additionally, the AP found that Kemp is currently holding up 53,000 new voter registration applications; nearly 70 percent of those applications come from Black citizens, in a state that is 32 percent Black. The applications are ostensibly being held because the information on them does not exactly match state or federal records, but these disparities could be as minor as a missing hyphen or a typo. 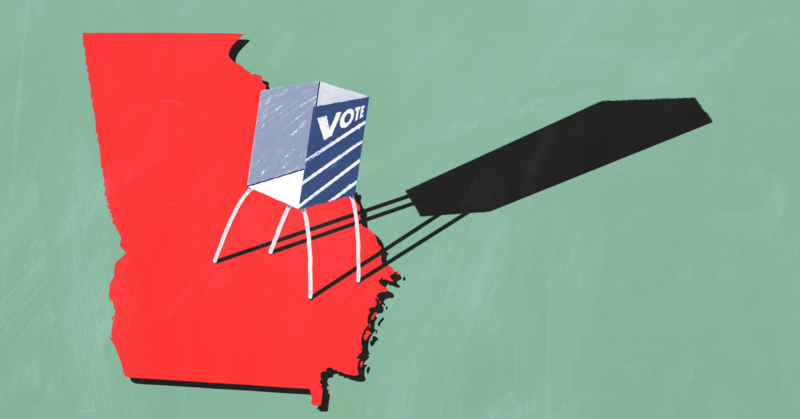 Many Georgians may be unaware that their applications have been put on hold or that they’ve been purged from the voter rolls, and now that the October 9 deadline to register to vote has passed, Kemp may have successfully suppressed their vote come November. Voters whose applications are being held up may still be able to vote if they present the right form of ID at their polling place, but this fact has been poorly publicized and could result in confusion for poll workers. This is just the latest episode in a well-established pattern of Republicans employing voter suppression tactics. Blocking people -- and especially minorities -- from voting is an obvious attack on democracy that deserves widespread media coverage. Unfortunately, most of TV news has turned a blind eye to Kemp’s suppressive tactics. Fox News, NBC, and ABC all completely ignored the story this week, making no mention of Kemp’s voter suppression since the AP report dropped on October 9. CBS made one attempt to cover the story, a quick report on its morning news show on October 12. CNN also failed to cover the story this week until October 12, when its programs finally began including packaged reports and other segments. This isn’t Kemp’s first foray into widespread voter suppression, nor is it the media’s first time botching coverage on important stories about voting rights. Fox News has long served as an ally in Republican attempts to stop voters from making it to the polls, but by failing to report on these efforts, mainstream media are also complicit in the destruction of voting rights.